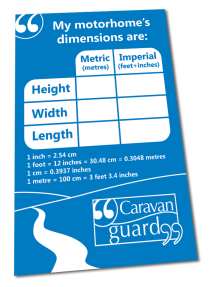 Caravan Guard have seen a 43% decrease in the frequency of motorhome insurance claims involving low bridges, since launching a free motorhome height sticker initiative to help motorhomers avoid damage in 2009. Because of their success the stickers are being relaunched for 2011. We saw a six fold increase in claims for accidents of this sort between 2005 and 2008, and with the average cost of a claim being £2200, decided something needed to be done to stop the emerging trend. Since the scheme launched Caravan Guard have not only seen a 43% decrease in motorhome and American RV insurance claims, but also a 31% decrease in the average cost of a claim compared to 2008. 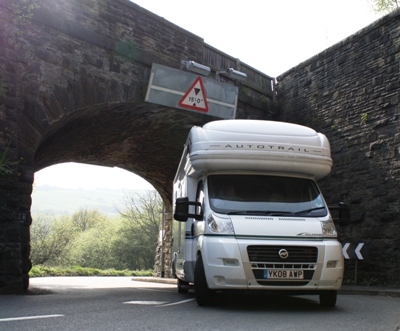 Showing that motorhomers are taking extra care when approaching low bridges. Simply fill in your details and the sticker will be sent out free of charge. Could I please request a free motorhome sticker as mentioned in July issue of MMM. We have just purchased our first motorhome and don’t want to damage her.